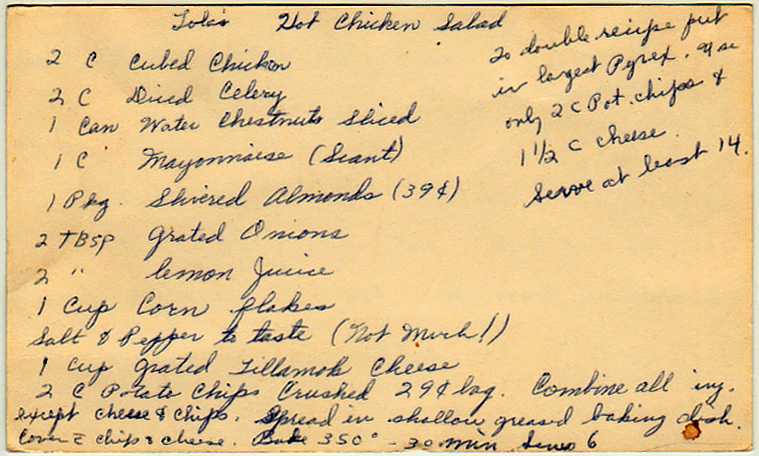 My guess is that this recipe is from the late 1960s. Why? 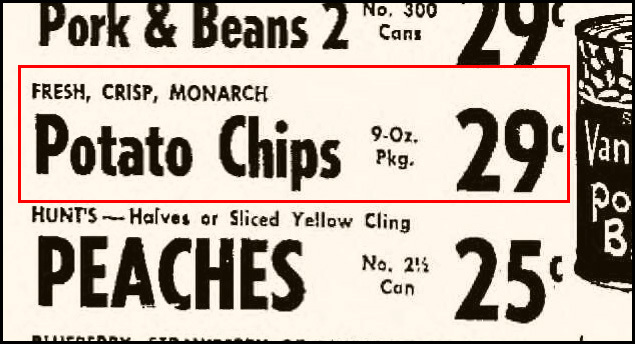 Because two cups of whole potato chips would be about 9 ounces, and a 9-ounce bag of potato chips cost 29 cents in the late 1960s. For example, the bag advertised in the ad on the left, from the December 28, 1969 edition of the Winona (Minnesota) Daily News. 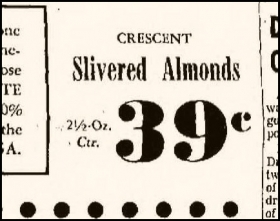 If that’s the case, then a 39-cent package of slivered almonds was around 2 to 2-1/2 ounces–for example, as advertised in the ad on the right in the April 22, 1965 edition of the Billings Gazette. Combine all ingredients except cheese and chips. Spread in shallow greased baking dish. Cover with chips and cheese. Bake 350 deg. — 30 minutes. Serves 6. To double recipe, put in largest Pyrex. 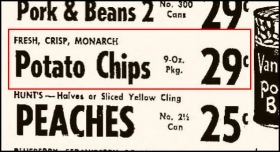 Use only 2 c. potato chips and 1-1/2 cheese. Serve at least 14. Compare to Yesterdish’s Chorizo and Chiles Macaroni and Cheese.